Current optical disc formats are less than ideal for archiving or backup purposes due to space constraints. It is often not possible to back up your root partition to a single disc, and while it is possible to span the archive on multiple discs, it not only is inconvenient but also increases the chance of data failure. Internal or external hard drives on the other hand offer Terabytes of space, which usually is enough to back up whatever you want to archive. The problem here is that the method works fine for sporadic backups, but when you need to back up regularly, you will either have to buy lots of drives, or delete old backups regularly to make space for newer ones. Business-specific archiving solutions such as tapes or cartridges offer high storage options (in the Terabyte range per cartridge) but come at a price. 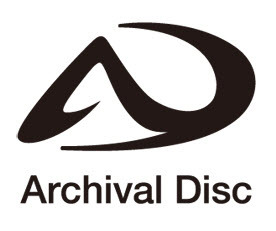 Sony and Panasonic announced the Archival Disc format officially today. 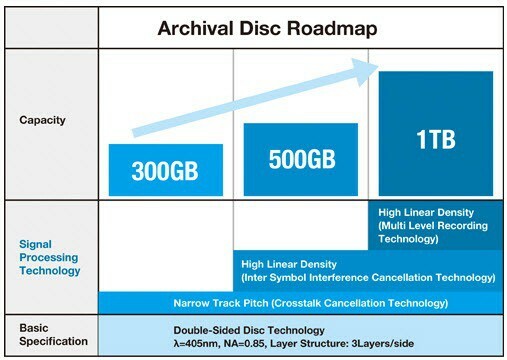 The next-generation optical disc format will launch in the summer of 2015 with a capacity of 300 Gigabyte. Both companies plan to increase that size to 500 Gigabyte and 1 Terabyte in the future. Blu-Ray Discs support a disc size of up to 128 GB, which means that the first iteration of the Archival Disc format increases that by nearly a factor of three. The Archival Disc specification confirms that the new format uses a double-sided disc technology with three layers per side and a data bit length of 79.5 nanometers and a track pitch of 0.225 micrometers. Sony and Panasonic emphasize that the new format has been specifically designed for "the market for long-term digital data storage". What the press release fails to address are the benefits of the new format in comparison to existing solutions. For example, while we know the storage size of the optical discs, we do not know how long they will last, how fast the recording speed or read speed is, or how much recordable discs and writers will cost. No information are provided whether the new standard supports re-writeable discs as well. The key specification lists write-once as the disc type only. The new format competes against a number of solutions. First against existing local backup solutions such as tapes, cartridges or external drives, but also against growing remote backup services. Sony and Panasonic target the professional market with the new format first and foremost according to the press release. This to me indicates that they won’t be. I highly doubt that, at least initially. I think that Hard-disks and SSDs are better options. I take it you also need an AD drive for this standard? Will that mean you need to plug yet another drive into your tower or would it replace current DVD/BluRay drives by working with all three formats? This seems like an odd solution in search of a problem. Flash drives and cards are pretty reasonable in size, external or network hard drives are relatively cheap and easy to use, and remote storage is only getting cheaper. ‘Professionals’ seem like the last people who’d need a format like this. If they are in IT they surely have their own strategy that is more robust than copying stuff to a disc now and then, and if they are in a creative industry (say photography) they already have plentiful, fairly cheap options to maintain their libraries. Unless the discs are cheap enough that you’d think nothing of burning a whole archive onto them very regularly, I don’t see the appeal. I guess long-term storage is its possible saving grace (hence the name) but you’d think if it could hold on to data for significantly longer than current formats it would have been a hyped feature. Sure, you need a new drive. Not sure if it will be backwards compatible or not, would be interesting to know. Disc will always have superior storage/price to traditional media like hard disk or flash based due to the nature of it. This would also be an ideal solution for semi portable 4K camera and the like for the portability. You wouldn’t think joint company would invest billion of dollar for thing like this if it’s not profitable, they’re not that stupid. Does seem a bit of a backward step given what’s out there already… but extra choice of what to use is good… or maybe the idea is to get the players out there… if you went into the pre-recorded music market, and added some fancy anti-copy feature, you could probably put an HQ video for every 24bit+ lossless audio track of a standard album on one disk. Collectors like their tangible original vinyl or cd special edition with booklet etc, and downloading music is one thing but owning a physical durable copy is something else. Sorry for that, but it cant be cheap at all. Remember , early in the Oct. 2012 Verbatim announced BD-R XL 100GB disk and it still cost least 26 € ! You can buy BD-R 25GB disk for 1€ from UK or Germany. Thats cheap. By the way, where have gones all the Holographic technology last few years informed over the media news – 100Tera capacity disk ??? I guess they all fall into the scientific research category and not in the ready for manufacturing category. Sony and Panasonic has a very different market to Tap and these companies have already seen a failure targeting unwanted audience..